One of the biggest developments in the City of Doral is Doral Isles. This is a gated community made up of 13 distinct neighborhoods, each on its very own isle. Each neighborhood has its own distinct personality and as part of the fastest growing area in Miami/Dade County, Doral Isles has something to offer almost everyone. Doral Isles is located in the heart of the City of Doral, but it has its own community feel to it and offers many amenities to residents. The community has five interconnected lakes, soccer fields, a clubhouse, parks, and many green areas for the residents to enjoy. Doral Isles is located between NW 58th street and NW 74 street, and between 107 ave and 104 ave. It is close to the Florida Turnpike, the Plametto Expressway, and the Dolphin Expressway giving residents easy access to the Miami area and the rest of Florida. There are a total of 1,721 homes and condos in Doral Isles which are just minutes away from the major attractions of the Gold Coast. It is the peaceful neighborhoods, central location, and quality of life which make Doral Isles such a popular place to call home. One of the most popular features of the community is The Island Club. The Island Club has two large heated waterfall swimming pools, fitness center with cardiovascular and strength training as well as free weights, and sauna. It also offers daily classes in kick boxing, yoga, step classes of all levels and other daily activities. In the Island Club there are men and women’s changing facilities, and a coffee bar. One of the pools has a shallow end especially for kids, making the Club the perfect place for families to enjoy time together in the sun. Many residents like to go to the Club, grab a refreshing beverage from the coffee bar, and relax and enjoy the Florida sunshine. 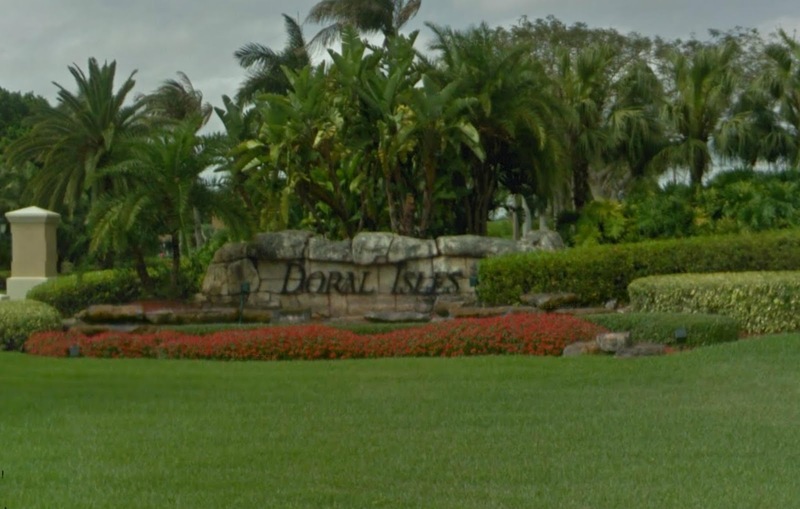 The Doral Isles real estate market has single family homes, townhouses, and condos for lease or for purchase. Prices vary from neighborhood to neighborhood. In the Barbados neighborhood a 4 bedroom, 2.5 bathroom coach home lists for $335,000.In the St. Croix neighborhood, a 4 bedroom, 3 bathroom detached home lists for $799,000. There are also luxury homes in Doral Isles which list for over $1 million. One example is in the Catalina neighborhood where a 5 bedroom, 3 bathroom detached home lists for $1.19 million. All of these homes have access to the lakes, The Island Club, and all of the amenities of the Doral Isles community. It is the central location, the safety of a gated community, and the beauty of the homes and neighborhoods which have made Doral Isles the biggest development of the City of Doral. With easy access to major highways and roads, Doral Isles is considered one of the most desirable addresses in the Miami/Dade area. Young families, single professionals, and retirees call Doral Isles home.